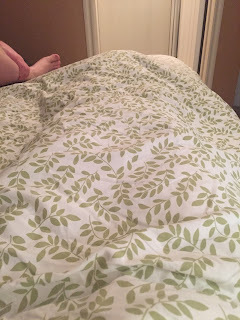 I washed our bed sheets last night with the new detergent I bought. I was so excited to go to bed and smell the amazingness that I was literally in bed at 9:00. 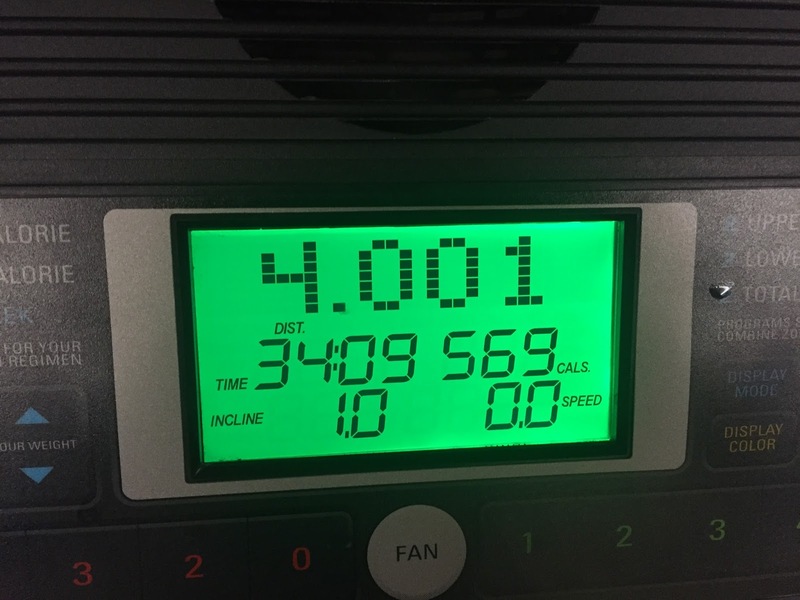 I woke up this morning and got my 4 miles in. Then we hit up the gym, and worked way longer than planned. Brynlie fell asleep in the car so I wrote tickets for an extra hour. I'm pretty confident the rest of our day won't be exciting enough to make a blog post about, so instead I am going to choose to address some questions I've been getting. I've had some questions lately from friends who are trying to get into running or just starting that feel lost and don'r really know what to do, or they're feeling discouraged, about how to make it fun, or what are some newbie mistakes they can avoid. First off, as a disclaimer, I always feel weird talking about running stuff. I don't really know why. I guess because I know I'm not an expert. I'm not an elite runner and I don't set insane PR's that no one else could possibly beat. 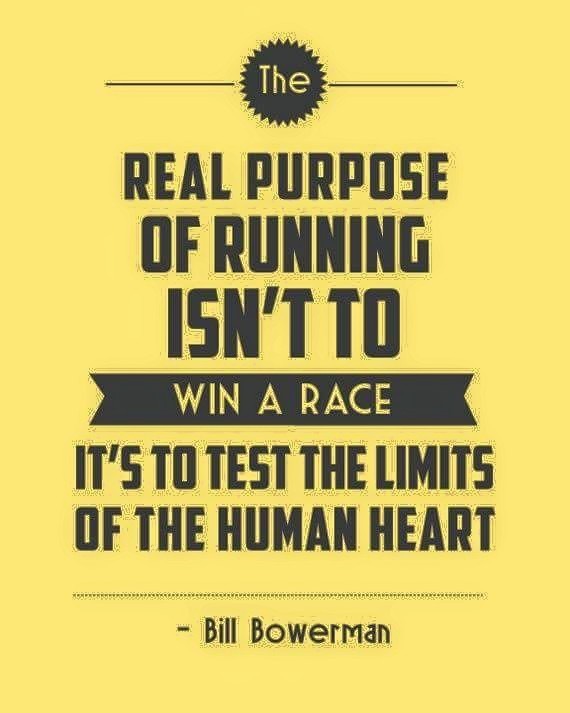 But that isn't what makes you a runner. Runners run. That's it. It doesn't matter how fast or slow, how often or how many miles, if you run, you're a runner. I'm just learning to accept this title for myself. And I have to say, it feels kind of weird. Up until 2009, I HATED running. I remember my first 5k I cried at the finish line because I couldn't believe I had ran that far. And I walked some of it! And now I'm running marathons. It's been a long time coming to get from point A to point B, and I may not be an expert, but I have learned a lot along the way. So, in an effort to help out those questions, I'll share my tips. I used to force myself to run every now and then, but I hated it and I would run about a minute and then walk. Run, then walk. I never had the desire to push myself and see how long I could run for. Then one day, I was in a VERY bad mood and I decided to go running just to blow off some steam. I laced up my shoes and set out. I remember making 1 whole mile and thinking, "Cool, I don't think I've ran a whole mile since the mile test in Jr. High." But I kept going. Then before I knew it, it was 2 miles. Then 3. I think 3 had been my all time longest distance I had gone in my life, so I decided to see if I could beat that. When I finally made it to 4 miles I was almost to my parents house from where we lived and thought, "How cool would it be to run to my parents? My mom would be so impressed!" Sure enough, I made it. I ended up running 5 whole miles. More than I ever had before!! The high I got from that was indescribable. A light went on and I finally understood why people did this. Shortly after I signed up for my first half-marathon and started training. My advice to those who are struggling is just stick with it. Eventually you will have your good day where you achieve something you never have before and you will feel amazing! Keep your goals small and achievable at first. Don't start with a goal to run a marathon if you've never ran before. That will overwhelm you. Start by running an entire mile without stopping, then increase that. Then run a little faster. There is always room for improvement and goals, and hitting those is what keeps us coming back for more. Don't worry about what other people can do. You aren't them, you're you! Do what YOU are capable of in the moment. I remember when I first started running, a 12:00 minute mile was fast for me. Now my "fast" is almost half that! Don't get discouraged. It'll happen. Running isn't easy on the body. It took me a while to learn the vast importance of stretching, foam rolling, and taking rest days. When I first started I would stretch a couple muscles for about 10 seconds each when I was done, and then wonder why I was sore or why my knees/hips/calves hurt. 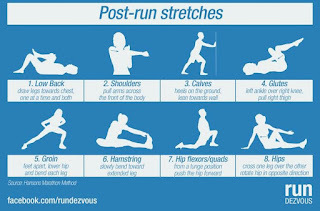 Stretching after each run is SO important. I can't overstate that enough. 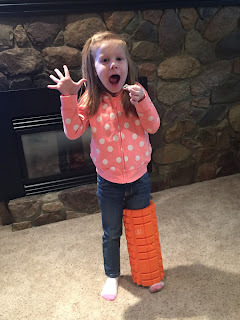 It helps prevent injury and makes the next runs easier on you. 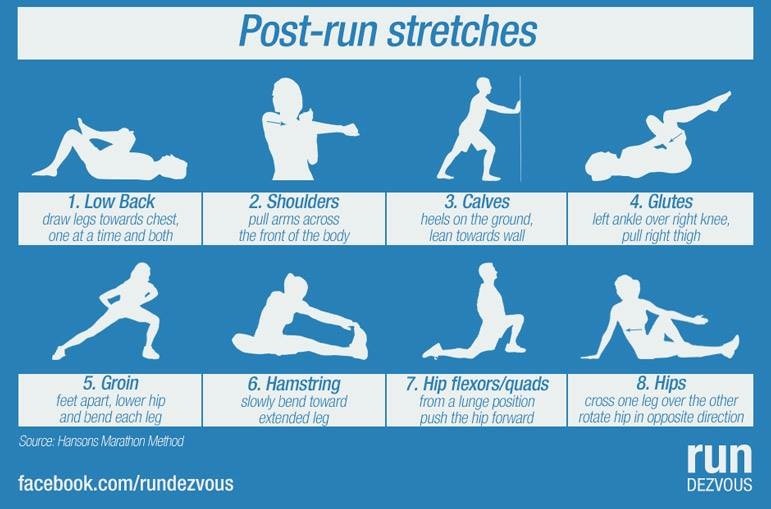 This chart has some good post-run stretches that target just about everything. Hold each stretch for at least a minute on each side. I spend a good 30 minutes stretching and rolling if I have the time. 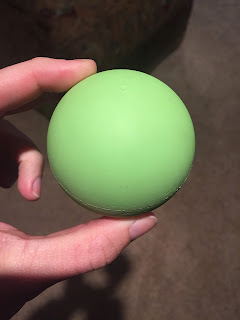 This is what a lacross ball looks like. They're perfect for deep places that need to be worked on. If you're going to get serious about running, you're going to need the right equipment for it. Getting the right running shoes for your stride is THE MOST important thing. 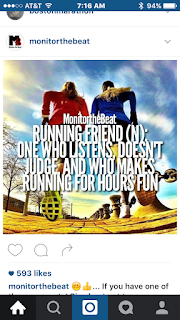 You can read more about that In my past post about running shoes. It's also important to get clothes that are comfortable, don't chafe, and wick sweat away from the body. Avoid anything with cotton. You can also buy Body Glide. It looks like a deodorant stick that you can apply to areas where skin rubs against skin or your clothes might bother you. 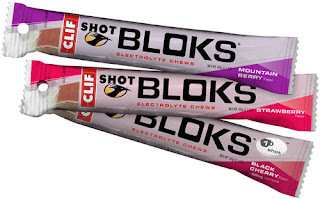 Which does NOT taste amazing but most definitely gets the job done. 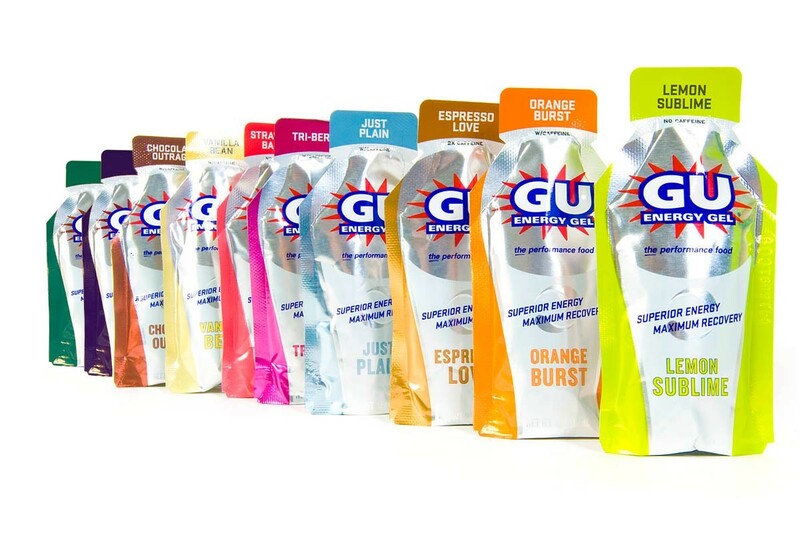 GU is my preferred choice, but I like to rotate between the two to avoid a caffeine overload, since the Shot Bloks I like are caffeine free. You will want to take these every 30-40 minutes on long runs to keep your body going, or else you'll crash and burn. It's also very important not to run on an empty stomach. Your body needs the fuel for the longer runs, so don't skip on breakfast! Anything with carbs and a little bit of protein is best. I like wheat bread with peanut butter and banana about 45 minutes before I head out. Oh gosh, I can't even tell you how much I love and appreciate my running friends I get to run with. There's something about suffering through together that just bonds you for life. 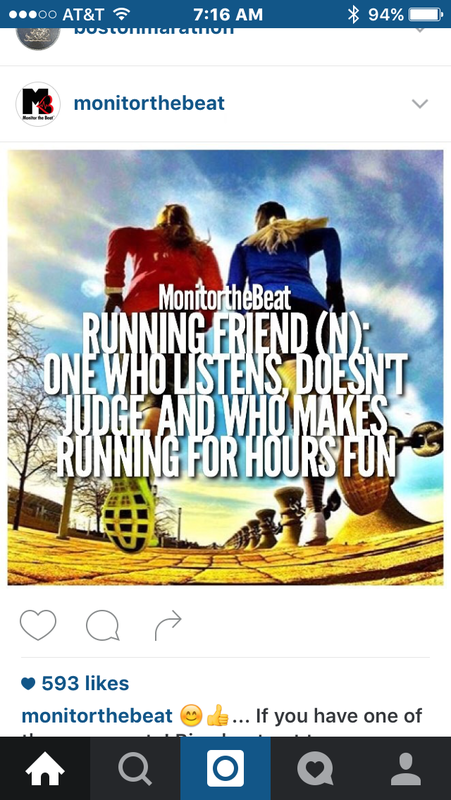 Running with friends makes it fun, it keeps you both motivated, and you can push and encourage each other. I vastly prefer running with my friends than running alone. 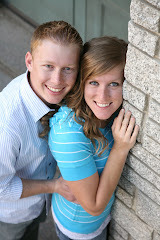 They make the time go by so fast! Hopefully this helps some of you who are just starting out. You can do this! With summer approaching, I know several people who are setting race-distance goals and are starting in the training process. Trust me when I say, when you cross that finish line and the medal goes around your neck, every single day will have been worth it.